Three weeks in the Alps have culminated in a quartet of champions, a slew of success stories and more than a few stragglers who’d rather forget their ordeal for over 3,000 kilometers in the French countryside. The race provided all the drama the organizers promised, from nervy climbs up the Alps followed by death-defying descents with the Maillot Jaune on the line to the final time trial in Grenoble with every step on the podium yet to be decided. Since the Tour provided fans with 21 stages of excitement, the least I could do is recap it with 21 points of interest of my own. These are the 21 items that makes this year’s ride through France a most memorable one. – There’s no doubt Cadel Evans is a worthy champion. His efforts to chase attacks in the Alps single-handedly, through mechanical issues, while still having strength left to attack proved him to be the strongest man in the race. His phenomenal performance in the time trial was indicative of his desire and thirst for Yellow after so many close calls and two appearances on the podium’s second-highest step. Perhaps the iconic image of this tour is Evans, racing jersey open, face contorted in pain as he turns himself inside out over a mountain pass, delving into zones of pain and oxygen debt scarcely fathomable. He never exuded strength the way Lance Armstrong did or harnessed the unadulterated climbing form of Alberto Contador or Carlos Sastre, able to match each sudden acceleration in kind and offer attacks of his own until cracking his opponents. He was constant and steady, tapping out his own cadence with rhythmic intensity, an approach you might expect from the oldest winner of the Tour since prior to World War II. As consistent as he was in the mountains, he was utterly spectacular on the final time trial. After a series of close calls, the former world champion deserves to be the first Australian winner of the Tour. – The mission of the Schlecks Leopard-Trek team was almost executed to perfection in its first ride of the Tour. At long last, Andy donned elusive Yellow, the foundations of which were laid on a Stage 18 win powered by team members sprinkled through the day’s breaks. But one flaw of the brotherly game was Frank’s inability to match his brother the following day, settling instead for the wheel of Evans and a free ride to the foot of the L’Aple d’Huez. That was the chance for the still unused addendum in the brothers contract – whereby one sacrifices the podium finish for the other’s win – could have been activated. But Frank couldn’t hold his brother and Contador’s pace, the chase group was swallowed up by the foot of the Alp and both Schlecks must again settle for a lower step on the podium. 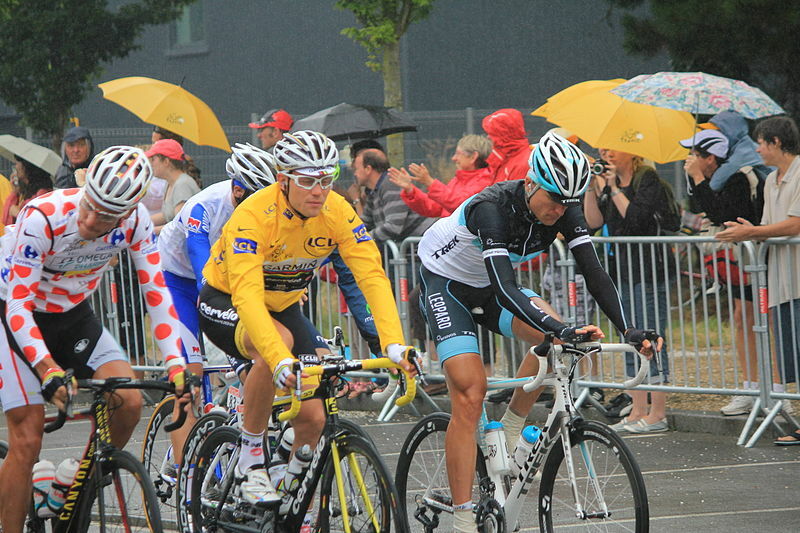 – Andy Schleck’s third straight runners up performance is worthy of sympathy. But at what point will Schleck realize he must learn to time trial? This may have been his best chance in a Tour that featured no prologue, a team time trial in which an excellent squad featuring several national champions and the greatest time trialist of a generation could limit his losses, and only one relatively short, slightly uphill individual race against the clock. In this age of cycling, with team tactics as they are and race radio making sure no one can hide, a pure climber who isn’t also world class in the race against time can’t win the Tour. Contador knew that and developed into one of the world’s elite time trialists (and not coincidentally stage racers). His team has the resources, and Andy has the legs. He had better hit the wind tunnel early and often in the next 11 months to try and banish this perpetual tour bridesmaid status. – I leave the Tour with conflicted thoughts about defending champion Contador. It’s a shame his race was effectively curtailed early by a knee injury and a bevy of falls and delays that cost him time in the opening week, especially since he proved to have the form to win the race in the Alps had he not started at such a disadvantage. But the sport benefits from the race being won by a racer never implicated with drugs in a decade in the professional peloton as opposed to a rider fighting to keep his last Tour title amid a doping scandal. The powers that be in the sport may be grateful Contador didn’t win in a few weeks when the final final verdict in his doping case comes down. – Contador at least deserves credit for turning up the pressure in the final days. But as Paul Sherwen and Phil Liggett pointed out repeatedly, a portion of the regret and sadness for the Schlecks’ time trial impotence is that they were the only ones “animating” the race in the mountains. The other GC contenders – Ivan Basso, Damiano Cunego, Tom Danielson – either lacked the legs or the desire to attack, and as wearer of the Yellow Jersey, the normally pugnacious Thomas Voeckler was forced to play defense. The only other top-10 finisher who showed much of an attacking mentality was Samuel Sanchez. – It’s a shame it’s taken until the sixth point to reach Voeckler, who deserves mention as hero 1B of the Tour. Despite repeatedly prophesizing each day the road ticked upward that it would be his final ride in Yellow, Voeckler found the legs to fight time and again. Often isolated without teammates and not a pure climber, Voeckler’s exploits were an exercise of sheer will. They were extremely beneficial to keep his wild-card Europcar team and French cycling in the spotlight of the television cameras day after day. His fourth-place finish is much deserved, as his new stature as one of the heroes of French cycling. – This Tour seemed to be oriented away from the sprinters at every juncture; the drama of the flat stages are inherently compressed into a few minutes as opposed to a few hours in the mountains and is minimized after the mountain escapades play out. Nonetheless, Mark Cavendish’s five stage wins are simply astounding. He is without a doubt the best sprinter in the world, perhaps soon the best sprinter the sport has ever seen. The Manx Missile’s turn of speed in the final 500 meters is unbelievable and almost unbeatable. His ability to finish – albeit controversially – in Paris with the Green Jersey indicates an evolution in his mentality to ride Grand Tours for more than just stage wins. And he’s only 26 years old. Imagine what he can accomplish in the next decade. It’s scary. – The other lasting legacy of this Tour is the amount of carnage rendered in the first week. Falls, crashes and pileups were the norm in deceptively treacherous racing through the flatlands of the north of France. The number of riders who abandoned the Tour in the first 10 days (17, plus Alexandr Kolobnev for reasons I’ll explain momentarily) compared to nine (plus two eliminations) in the finals 10 days indicates something wasn’t right with the route design. The course provided lasting and unfortunate images we’ll be seeing for years – Juan Antonio Flecha being thrown from his bike by the infamous French television car, Jurgen van den Broeck sitting on the tarmac in a daze, Jani Brajkovic being lifted into an ambulance. – Injuries aren’t the take-home message the organizers wanted. But at least, once again, the story isn’t doping. If the race claims riders, that’s one thing; organizers having to expel them is entirely more damaging. The only exclusion from the 2011 Tour was Katusha rider Alexandr Kolobnev, who “withdrew” after testing positive for banned diuretic hydrochlorothiazide after Stage 4. A “B” sample confirmed the non-negative result, and the matter is in the hands of the Russian cycling federation. Kolobnev is an excellent cyclist who counts two world road race silver medals and the 2008 Olympic road race bronze to his palmares. But the profile of the rider, nature of the substance and solitary nature of the violation (for now) bodes well for the continued recovery of the sport’s image. – Time to play the “what if” game. Imagine how much more explosive the mountains could have been had injuries not taken their toll on so many GC contenders. The infusion of Bradley Wiggins, Jurgen van den Broeck, any portion of RadioShack’s four-pronged attack and Alexandre Vinokourov would have upped the ante and perhaps altered the course of the Yellow Jersey. It may help some teams eventually, though. For example, imagine if Omega-Pharma Lotto returns in 2012 with stage-winner and Yellow Jersey wearer Philippe Gilbert, stage-winner Andre Greipel and back-to-back mountain revelations van den Broeck and Jelle Vanendert. Not a bad squad. – What a tremendous tour for American cycling teams. BMC rode the GC leader home to go with a stage win for Evans. HTC-Highroad, still in search of a sponsor for next season, won six stages (5 for Cavendish, one for Tony Martin in the time trial). And Garmin-Cervelo showed themselves to be the best team in the race. They won four stages (Thor Hushovd twice, Tyler Farrar and the team time trial), while Hushovd wore Yellow for eight days. It was the only team to place three riders in the top 20 on GC thanks to Tom Danielson (ninth), Christian Vande Velde (17th) and Ryder Hesjedal (18th). Danielson’s came in his first Tour, while the rides of the latter two in the mountains were remarkable after suffering early crashes. – Voeckler is undoubtedly the revered hero of the French in this race. But the accomplishments of Jeremy Roy have to be recognized as well. The race’s most aggressive rider, Roy was in the breakaways almost every day and came agonizingly close to the win in Stage 13 before being caught by Hushovd. Roy must have spent about 1,000 kilometers out in front of the peloton, and the FDJ rider wore the polka dot King of the Mountains jersey after that Stage 13 ride. At 28, Roy could develop into yet another French stage poacher extraordinaire. – Finally French cycling appears able to not just settle for stage winners, as they may have legitimate GC contenders in the stable. There will always be riders like Sylvain Chavanel, Samuel Dumoulin and Sandy Casar to try for breakaway wins (and in fairness, Voeckler probably belongs more in this category). But a perusal of the top 10 reveals two Frenchmen (tied with Spain, Italy and Luxembourg for most) thanks to the sneaky ride of Jean-Christophe Peraud of AG2R to finish 10th. Not only was the French stage win drought broken by Pierre Rolland on L’Alpe d’Huez no less, he also claimed victory in the White Jersey for best young rider. In fact, each of the top four in the young rider standings has French connections. Rein Taaramae, who turned 24 in April, was the runner-up to Rolland and 12th overall; while he is Estonian, he rides for French team Cofidis. Third is Frenchman Jerome Coppel of the disappointingly anonymous wild-card Saur-Sojasun, who finished 14th overall. And one place behind him in the White Jersey competition and GC is Arnold Jeannesson, the FDJ rider who enjoyed a stint in White. A few years’ time could see one of these young riders ascending the top step of the podium. – Much like Roy, the other cult hero of the race is Johnny Hoogerland, who went from relative unknown on wildcard Vacansoleil to King of the Mountains leader to that tough SOB who got back on his bike after the Flecha-car collision domino effect sent him flipping into a barbed wire fence. Here’s hoping the tough Dutchman becomes a fixture in Tour breakaways for years to come. – The final jersey taken home is Samuel Sanchez in the King of the Mountains. The reason it bears mention last is that it was the least entertaining competition thanks to the organizers’ decision to up points on big climbs and strip points from minor climbs for breakaways. Sanchez won with 108 points – 32 on Plateau de Beille, 40 on Luz Ardiden, four on the Stage 19 pass of the Col du Galibier and 32 on L’Alpe d’Huez. I’ve always seen the KOM jersey as a reward for constant protagonists, a competition of pride that makes the hours baking in the breakaway worthwhile. Instead, the emphasis on the mountains means a day can wipe out two weeks of effort. It makes it a peripheral accomplishment for GC contenders and steals some of its prestige and desire. – To return to Cavendish, it really is remarkable the effect he has on the peloton, almost single-handedly forcing an evolution of sprinters. Every rider if Cavendish’s leadout train can execute to perfection, ticking off the names Danny Pate, Lars Bak, Tony Martin, Bernard Eisel, Matt Goss and Mark Renshaw one-by-one in the final 10 kilometers, Cavendish will cross the line first nine out of ten times. It was a leadout issue – running out of support riders too soon from the finish – that precipitated the only stage in which Cavendish was nipped at the line, the Stage 3 win by Tyler Farrar. But that was one of only two wins for sprinters (see Tom Boonen, Alessandro Petacchi, Jose Joaquin Rojas, etc.) in field sprints that included Cavendish, the other being Andre Greipel’s revenge-fueled triumph in Stage 10. Another field sprint came in Stage 6 with Edvald Boasson Hagen getting by Goss with Cavendish missing from the fray. Instead, sprinters have turned to more creative strategies to pick up wins. Boasson Hagen was out on the break in Stage 17 and proved on the Champs-Elysees that he’s just not fast enough to get by Cav. Greipel tried to get into breakaways in later stages. And Thor Hushovd won two (TWO?!?!) mountain stages by getting in breakaways knowing he is no match for Cavendish in an out-and-out run to the finish. It’ll be interesting how long riders decide to fruitlessly go stride for stride with Cavendish in the final few hundred meters before realizing there are other ways win. – Speaking of Boasson Hagen and Hushovd, what a Tour this was for the Norwegian contingent. Four wins and eight days in the Yellow Jersey are pretty amazing from any two guys; the fact that they hail from the same non-traditional cycling nation is almost unthinkable. Hushovd is enjoying a career renaissance that may or may not continue with Garmin-Cervelo next season. Boasson Hagen is one of the best young sprinters who could turn into a dynamite classic rider as he matures. The tragedy that nation experienced last week heightens their accomplishments and can hopefully give some comfort to a grieving nation. – While we’re on the sprinters, one of the best moments of the entire Tour came in that Stage 3 win by Farrar and his emotional tribute to late friend Wouter Weylandt. Runners-up include any ovation given to Voeckler, Rui Costa’s emotion win in honor of fallen teammate Xavier Tondo on Stage 8 at Super-Besse and the televised scenes in Stage 3 when Anthony Charteau of Europcar sprinted ahead of the peloton to meet his family and young kids near his hometown. – George Hincapie’s feat of finishing a 15th Tour, the 16th in which he’s participated to equal the record of Joop Zootemelk is amazing. Perhaps more astonishing is that the win by BMC teammate Evans means he’s shepherded a winner to the finish line more than half of those times (nine). Hnicapie will turn 39 just a week before the start of the 2011 Tour and appears open to giving it another record-setting go. Hey Bjarne Riis, I’d think about trying to sign him, for the luck alone. Plus he, Jens Voigt and Stuart O’Grady would combine for over 40 Tours ridden. – There were unfortunately plenty of teams that come out as losers. Team RadioShack is obvious, with three of their four pre-Tour favorites crashing out. Rabobank lost relevance in the GC race quickly as Robert Gesink suffered early, though Luis Leon Sanchez did score a stage win. Early crashes forcing the abandonment and subsequent retirement of Vinokourov and the slowing of Roman Kreuziger forced them to chase ill-fated breaks (though Maxim Iglinskiy almost restored a modicum of pride with strong mountain rides). Short of Rein Taaramae, Cofidis was extremely quiet, often failing to get into breakaways. The same goes for Katusha and Quick Step, both hampered by the premature departures of sprinters Denis Galimzyanov and Tom Boonen, respectively, though Kevin De Weert delivered a surprising 13th place finish on GC for Quick Step. – Last but not least, literally and figuratively, it’s time to hand out the most prestigious award of the bunch: The Lanterne Rouge, given to the last rider in the general classification. Unfortunately last year’s winner Adriano Malori was unable to repeat, finishing a disappointing 91st and continuing the search for consistency since the retirement of Wim Vansevenant. This year’s honor remained in Italy though, with Fabio Sabatini of Liquigas finishing 3 hours, 57 minutes, 43 seconds off the pace set by Evans. Things looked close going into the final time trial, but Sabatini surrendered over a minute to runner up Andrey Amador of Movistar to ensure the only Costa Rican in the race would finish 166th. Danny Pate of the United States was third-to-last, 12 minutes faster than Sabatini’s pace.